Named by the Urban Land Institute as the Most Innovative city of 2013 and hosting the UN Habitat’s World Urban Forum Cities for Life next April, Medellín has become the center of attention for many local and international organizations. The radical social and urban transformation that the city went through in just a little more than a decade is remarkable. For example, in 20 years the city went from having the highest homicide rate in the world to the lowest 14th ratio in the world. In that same period of time, the urban landscape has seen the emergence of new public transportation systems, large investment in social and educational infrastructure – especially in marginalized areas, and a revitalization of critical urban spaces. The underlying presence of design – urban and architectural, can be clearly associated to the principles behind the city’s transformation. It’s no wonder then that projects like the Metrocable and the Parque Biblioteca España in Santo Domingo have become icons of such process. Following the same model, similar projects in Rio de Janeiro and other cities have had the same effect. And so, as the as the social catalyst power of architecture and urban design is accentuated by the institutional and political forces behind these changes, one could only ask how these “architectures” should be conceived, designed, constructed and maintained. In this post, I would like to briefly comment on two concepts that, among others, I think are critical: presence and significance. Many of the projects constructed recently in informal settlements are either inserted into, or built on the edge of, the complex fabric previously generated by uncontrolled growth. As such, these new buildings and public spaces tend to either blend or contrast with the existing context. Most of them, because of its scale and multi-programmatic content differ in size and form from the beginning of its conception, but many of them are also iconic and drastically differ in design and image. The intent, some of their designers argue, is to generate quality and dignity through symbolism. This symbolism, which arguably points towards “other” ways of living – namely, the ways of living that those who inhabit informal communities aspire (or “should” aspire according to the conceivers of the interventions), is then provided by the state (and the architect – if involved). It is the presence of this aspiration through which significance is then attached to the architectural or urban project, turning it into an object of desire and thus ‘igniting’ the need for change. Based on this concept, I want to briefly discuss two recent experiences I had while visiting Medellin and Rio: the Parque Biblioteca España in Santo Domingo and the UPP Fazendinha building in the Complexo do Alemão (or almost any other UPP building for that case). 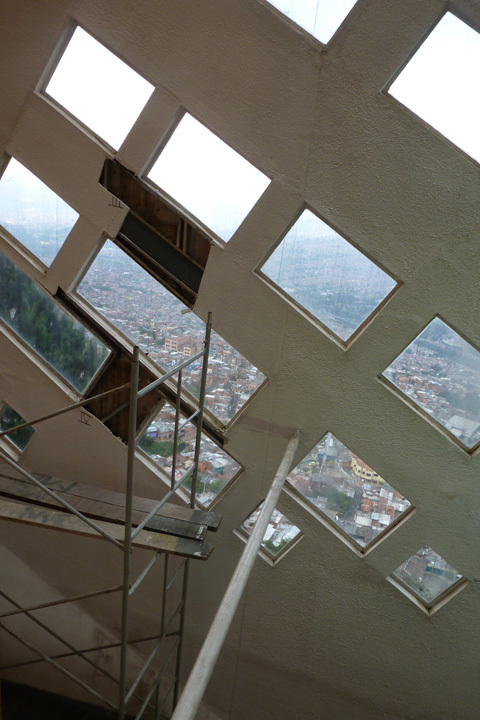 Together with the city’s metro and the Metro Cable systems, the Parque Biblioteca España is for many the most symbolic project of the transformation of Medellín – specifically that of the Comuna 1. The widely published image of the three black, stone-covered volumes that compromise the library overlooking some of the poorest barrios of the city has become the emblem of urban and social change. Less attention though, has been given to smaller, yet probably similarly achieving urban interventions throughout the now articulated neighborhoods. But two events in the last year have affected the encouraging situation and brought a series of important questions to the table. The first one is the recent detachment of parts of the library’s stone façade due to water infiltration and other constructive problems. Just after 6 years of its inauguration, and an investment of almost 5 million euros, the library lies covered with black textiles to avoid any possible wall detachments falling onto public spaces. 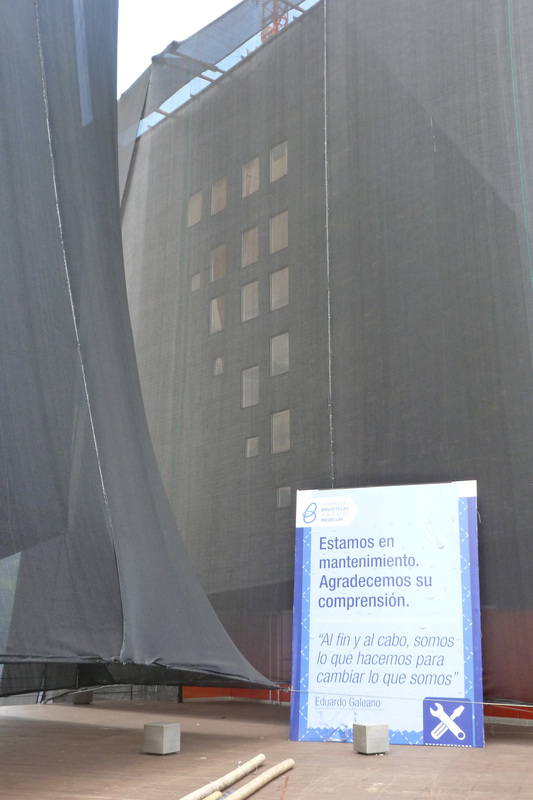 With a large sign outside that reads “Al fin y al cabo, somos los que hacemos para cambiar lo que somos” (or “After all, we are what we do to change who we are”), the building is now undergoing an important restoration that some argue might cost as much as one third of the project’s initial construction . To make things worst, not so long ago and almost next to the library, a bamboo bridge – another governmental intervention that connected two of the nearby neighborhoods, collapsed . And so, as the city hurries to finish the restoration of the library and either fix or dismantle the bridge before the World Urban Forum in April 2014, one can only think what does the “presence” of these projects – as they lie today – mean for the community and the state. At the same time, it brings to the front the holistic relationship between form and symbolism, and the economic, cultural and social implications of architecture. 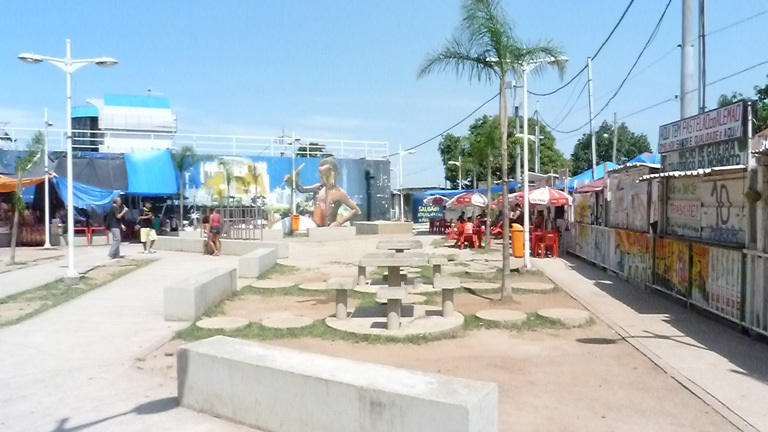 The second example is the UPP Fazendinha building in the Complexo do Alemão. 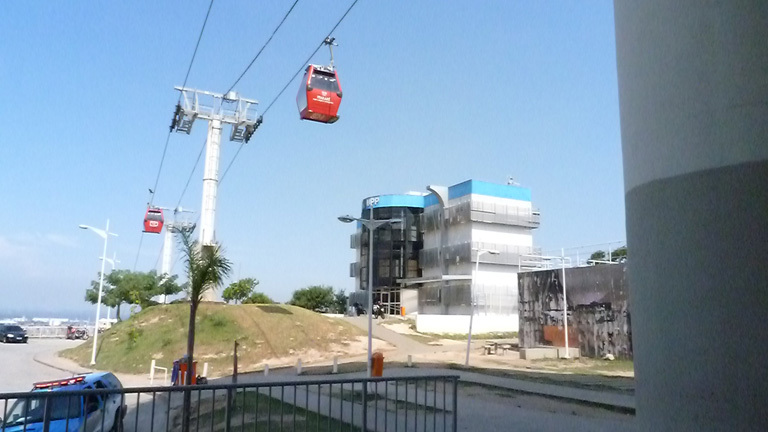 Similar to other UPP buildings in other locations, this is an institutional structure – with very few architectural qualities I would argue – that sits on the top of one of hills next to the Palmeiras cable-system stop. In this particular case, it is not so much the architectural symbolism I want to focus on, but the location and scale of the building that imposes itself onto the public space generated around the station. As it has been pointed our in other posts and in an attempt to “pacify” the favelas before the World Cup 2014 and the Olympic Games 2016, the city has made it clear that the police and state have a presence in the communities. But according to Raquel Rolnik and other observers, the geography of UPP locations matches the points were favelas intersect with the richer neighborhoods of Rio , bringing into question the real motive and need behind the stations. In relationship to this issue, during a recent visit to Alemão and Rocinha, I had the opportunity to meet with community leaders and members of different neighborhoods, and a continuous topic that emerged during our conversations was police abuse after the implementation of the UPP Program. In the specific case of the UPP Fazendinha, it called my attention that the building was both neglecting the public space, but also completely disengaged with the overall arrangement of other spaces. 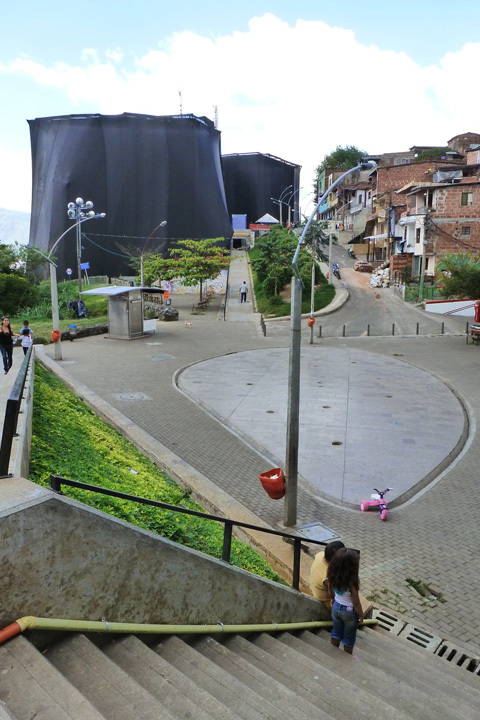 I could not but think that differently from Medellín’s Integral Urban Projects (PUIs), the cable system stops in Alemão were not conceived in a comprehensive way – leaving all social, economic and social aspects of the intervention as an afterthought in terms of their architectural and public design. Much has been said about the success of the urban interventions in cities like Medellin and Rio de Janeiro – and there is no doubt that positive changes are taking place in both cities, but it is important for designers to evaluate and rethink not only the way in which these projects are conceived, but also built and maintained as part of a sustainable physical, social and economic strategy that could truly bring stability and opportunities to these forgotten areas of our cities. 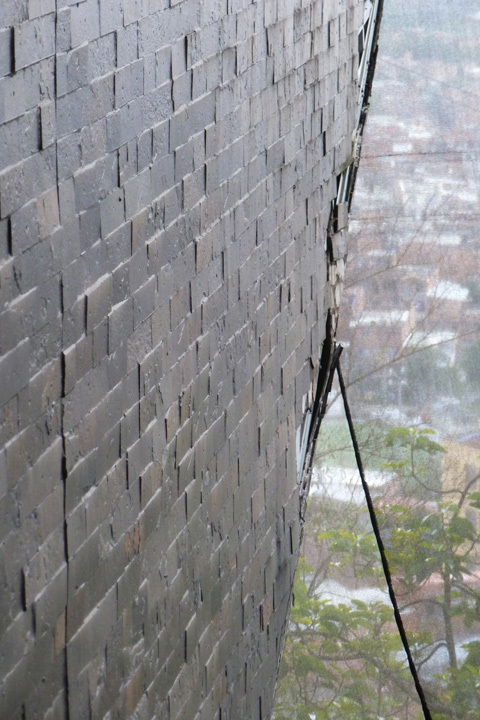 Click here for related links on Medellin’s PUI and others , as well as Rio’s Alemao and UPP. I agree with you Luis Diego… plans and designs should be supported with plans to maintain them in time… this is a common pratice in the rest of shperes of society: business, for example, requires financial projections and flow analysis before even being approved… why is this not the case with interventions like these? Medellin had the same type of issues with a lot of the schools built in poor areas, with imported toilets and other luxurious things that do not really fit in, not because the poor do not deserve them, but because they miss the whole point of these interventions: to bring a sustainable, LONG TERM positive change to the communities to which they are aimed at.